North Attleboro, Mass. – Jake Noviello made sure Franklin’s final pitch to the Super Eight committee was a strike. 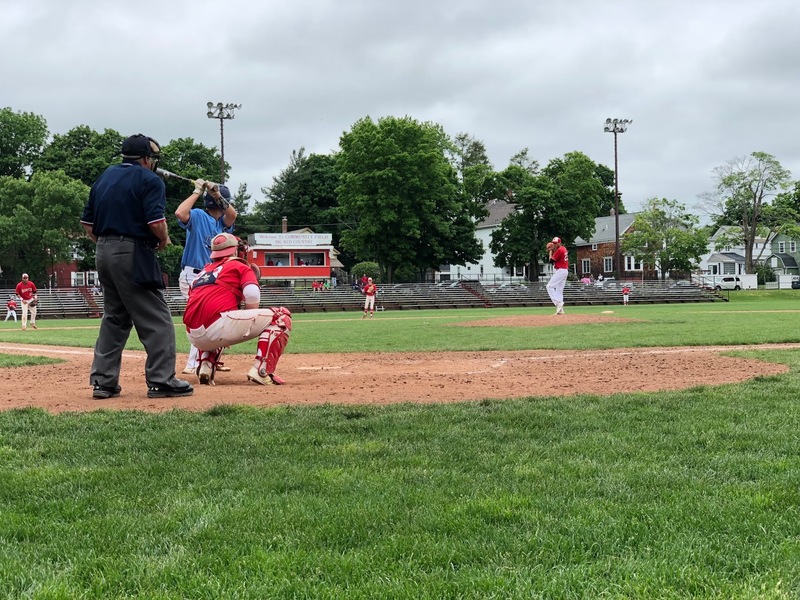 Noviello went eight innings, allowing one run on four hits while striking out a dozen and in the top of the ninth Michael Langmeyer provided the go-ahead RBI single as part of a five run frame to send Franklin to a 6-1 win over North Attleboro on Memorial Day at Community Field. Noviello appeared to get stronger as the game went on retiring 15 of the final 19 hitters he faced while allowing just one runner to reach scoring position after the fourth inning. The Franklin (17-5) right-hander surrendered just one free pass while throwing 106 pitches. Red Rocketeers’ (16-2) ace Nick Sinacola matched Noviello pitch-for-pitch over the course of the first seven innings. Featuring a lively fastball to go with a tight slider, Sinacola struck out 12 over 7.1 innings of work. With the scored tied 1-1 in the top of the ninth and Sinacola out of the game, the Panthers blew it open. Evan Wendell reached on a two base error, moved over to third on a sacrifice bunt, and scored on Langmeyer’s RBI single that made it 2-1 Franklin. Two batters later, Colby Fitzgibbons provided the Panthers with some insurance lacing a two-out RBI single to left center to give Franklin a 3-1 lead. After an intentional walk put two men on, Alex Haba put on the finishing touches as he launched a three run blast to dead center to give the Panthers a 6-1 advantage. After Sinacola set the Panthers down 1-2-3 in the top of the first, Zach DeMattio gave the Red Rocketeers the early advantage drilling a high fastball to center field for a solo shot to give North Attleboro a 1-0 lead. Franklin got the run back one half inning later as Jack Nally turned on an inside fastball and hit it into the bleachers in left field to tie the score at one. Both Noviello and Sinacola settled in after that combining to allow just one runner to reach scoring position up through the sixth inning. In the top of the seventh, with the score still knotted 1-1, Franklin had a chance to take the lead as Steve Luttazi singled and Neely walked to put two on with one out. Sinacola, however, made his best pitches of the afternoon inducing a pop up and recording a strikeout via his fastball to keep the game tied. With a chance to walk-it-off in the bottom of the seventh, North Attleboro’s Nick Raneri singled and moved all the way over to third with one out when Noviello’s pickoff attempt went wild. The Panthers, however, recognized a Red Rocketeers' suicide squeeze attempt, executing a pitch out and tagging Raneri as he headed for the plate to send the game into extra innings.